DC’s Rebirth #1 may be a few months old, but it did some serious reinvigorating of the DC Comics brand. 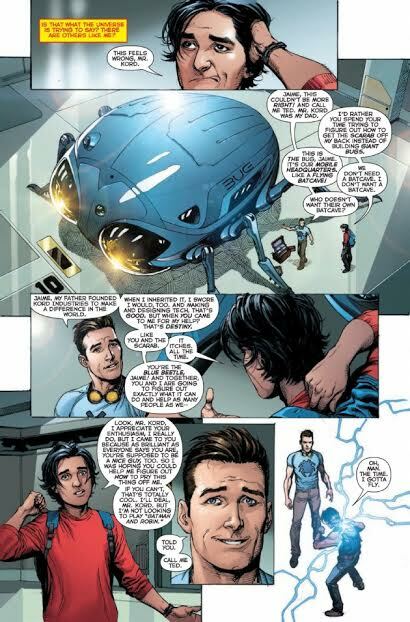 I enjoyed some aspects of the New 52, but to many people, it embodied everything they disliked about DC. Some people hated the loss of legacy, some people felt they were suffering from "reboot burnout", and some just thought the stories weren’t cutting it. I would argue the Snyder's work on Batman and Brian Azzarello’s Wonder Woman were fantastic and some of the better all-time DC stories, but the New 52 was fighting a losing battle to "perception". It became a rallying cry for many on why DC "wasn’t good anymore". Agree to disagree. 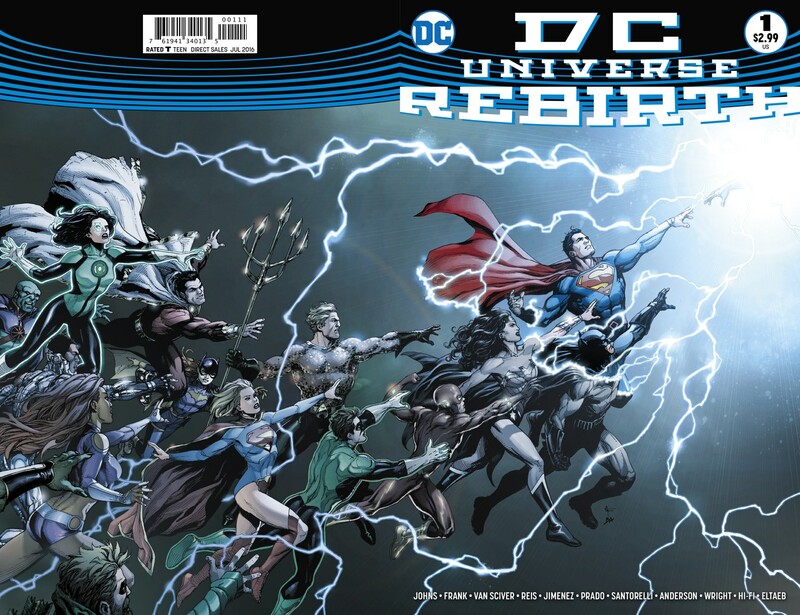 Now Rebirth comes along and is highly successful, with subsequent DC Rebirth titles exceeding sales and, more importantly, creative expectations. To myself and many others, Rebirth feels more like a "Refocus" rather than a "Reboot". DC in the 80s was lucky enough to hear New President of DC Entertainment, Geoff Johns, speak at 2016’s San Diego Comic Con. He expressed that Rebirth was his temporary swan song to DC comics, for the moment, because of his recent promotion with Warner Brothers. 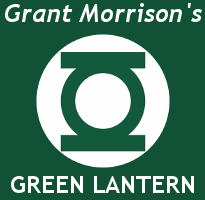 The new position will have him writing and collaborating on all DC movie and TV projects going forward. An incredible gain to the entertainment side, but a loss to the comics side. The panel itself was called "DC Rebirth Secrets" , but nothing too secret was revealed. Geoff did speak about his collaborations with writers and artists on Rebirth titles. He would sit with the creators, and try to figure out what makes these characters great. What has made these characters survive for so long? What do the fans love about them? What was lost in the New 52 reboot that needs to return? He talked about getting to the essence of these characters and challenging the creators at DC to put out stories with lasting power. At least that’s what I got out of it. I may be paraphrasing. The reason DC in the 80s is so interested in Rebirth is because of how many strong 1980’s DC elements were incorporated into Rebirth. DC’s strength is legacy, the constant recreations, the rich history of each character, and the classic stories told through multiverses. Rebirth #1 was chock full of those strengths. Here are my personal top ten. 1. Page 1, Panel 1. The face on the watch, the familiar lettering, and a story about a watch being given to a young person. For those of us who grew up reading comics in the 1980s, or loved reading comics from that era, it’s a powerful combination of images. Yeah, yeah I get it, don’t touch the characters, I’ll address that later. We know it’s meant as a throwback to Dr. Manhattan talking about his Father. 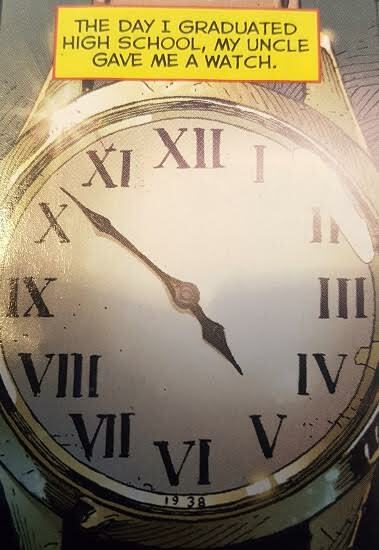 We know how Alan Moore used the clock in his storytelling, and if you were a real Watchmen nerd, you know the plot device Moore used with the clock to create a cyclical story. All in all, the story turned back the clock in many ways, and also had the feel of moving time forward. And no one stepped on the watch. "The air grows too warm, too quickly." 2. Page 4, Panel 3. The three Jokers. 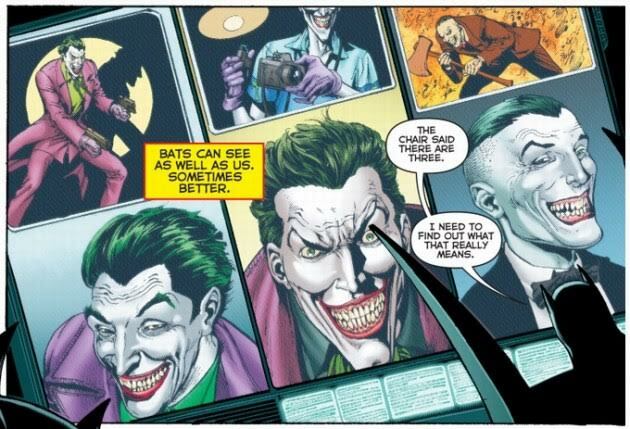 The middle Joker top is from The Killing Joke. The Joker on the left is the Bob Kane/Jerry Robinson Joker who is the original 1940s version. In the 40s and 60s, people who read comics or watched the TV show knew the Joker. By 1989, there were few people who were in touch with modern culture who did not know who the Joker was. Between The Killing Joke, Jack Nicholson and Death in the Family, Joker was elevated to 'mythical status'. When people went to the comic book store in 1989 looking for a story, how many were pointed to The Killing Joke? I know they just did a controversial cartoon version, but that iconic Hawaiian shirt and straw hat is still as 80s as you get. Taking pictures of Babs is still as creepy as it gets. Crisis on Infinite Earths #2 (1985) is what got me into comic books. From the moment I saw Anthro looking at the Legion of Super Heroes world, my mind exploded. "DC Comics has cavemen and is in the future?" That was it, the concept of many times, and the multiverse, made me fall in love with the cannon. It seemed so large, so much more than just the Super Friends. Yeah they killed the Infinite Earths JUST as I got into it, but it didn’t make me love the multiverse concept ANY LESS. 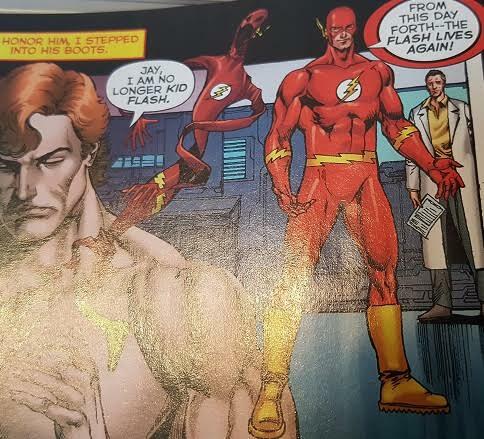 This panel is a call back to when Wally West took on the Flash name after Barry Allen had sacrificed his life. It’s a complete throwback to a George Perez and Jerry Ordway panel, and EVERYONE knows, those two are some of the best to ever draw comics, in any Universe. Jay Garrick all proud of the third generation legacy character. 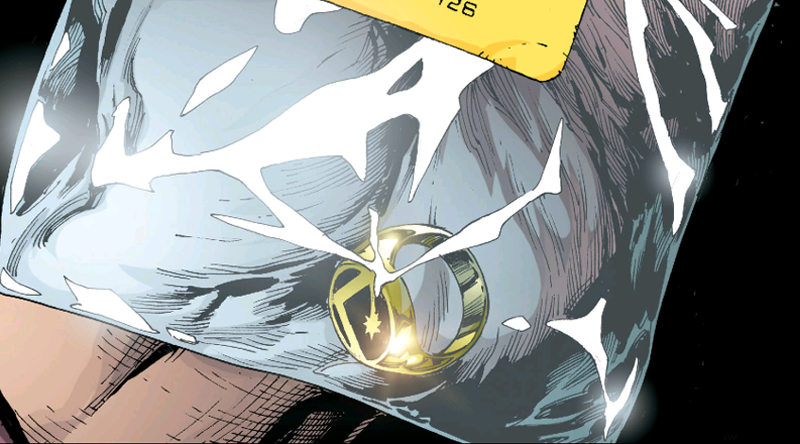 I can’t speak to the Legion rings from the 70’s, but the ring here speaks to me of the Legion of Super Hero rings from the 1980s. Paul Levitz’s run on LoSH is one of the most amazingly underrated runs on a comic book EVER. And whenever Keith Giffen worked on it, well that’s some of my favorite work of all time. I think I read the "prestige format" Legion of Super-Heroes #1  ten times in a row. The shadows, the Legion of Super Villains, the 'Ambush Bug artist' being serious. It was all too much for me and is such a huge part of why I’m addicted to 1980s DC. The Steve Lightle stuff is CLASSIC as well, especially when the new Legionnaires were introduced. I could go on all day. Since Crisis, the Legion has a well-documented problem with continuity, suffering from so many re-boots, that it seems to have re-booted itself out of existence. Still, the smile (Saturn Girl?) and the ring have me feeling like its summer of 1985 again and I’m reading about Shrinking Violet and Micro Lad fighting. Here DC, take my money. *Note* I don’t want to post a picture of it. Just don’t. Constantine and Swamp Thing bickering. Swamp Thing wanting to save Abby, Constantine taking the piss out of the situation. If you don’t own Swamp Thing’s American Gothic [The Saga of the Swamp Thing #37 - #50 (1985/1986)] in any format, please go out and buy it right now. RIGHT NOW. This is it. 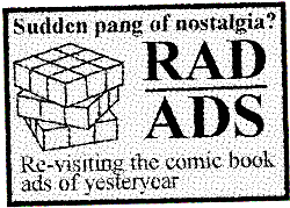 The most 80’s of 80’s panels. Kid Flash striking the classic Barry Allen Flash pose from Crisis on Infinite Earths #2. What was he telling Batman? Why did he look so weak? Why did he look so sad?! These ate me up when I was a kid, and this story captured those feels all over again. In Rebirth, we follow the story of Wally wanting back into reality, but realizing he has no place. Wally West, who struggled being a super hero in Marv Wolfman and George Perez’s New Teen Titans. 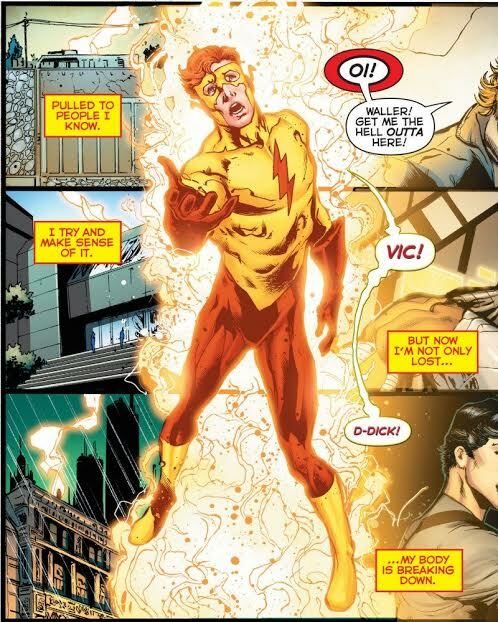 Wally West, who bravely took on the Flash mantle after Barry Allen had died. Who starred in an amazing Mike Baron and Jackson Guice series right after Legends. Wally West, who was everyone’s Flash from 1986 until 2006. Here he is, trying to make sense of what is going on, trying to find a place in this Universe. This is an allegory to the love of the 80s and legacy that was lost with the New 52. This is DC’s Legacy reaching out it’s hand and asking “Is there a place for me?” YES THERE IS DC LEGACY. I am all about it being back. 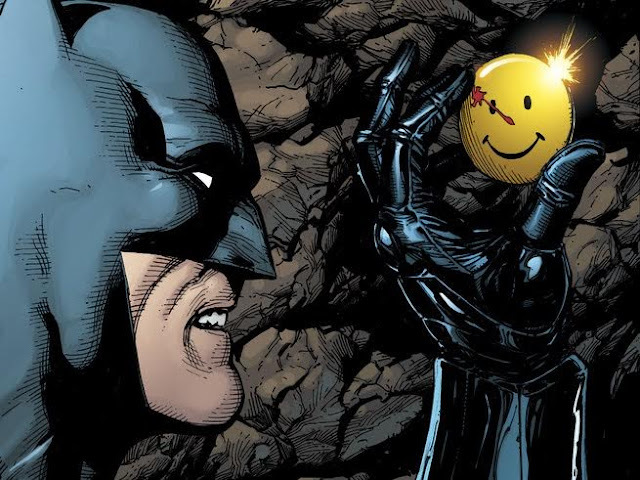 Batman pulling out the smiley face with human bean juice on it. You can buy Rebirth anywhere you would buy comics, and I SERIOUSLY recommend it if you love DC comics from the 1980s. Thanks and see you soon!